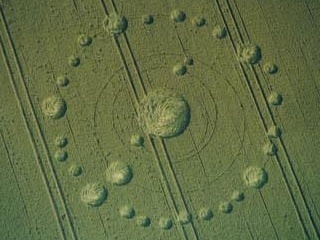 Crop circles - Lightning discharge electricity. Explanation, decipher, decode, discovery, break code, explaining, decryption, puzzle out, scientific research. Better barley, brewery, malt, brewing, beer. Also copyrighted photographs. Â© cropcirclesonline.com, Â© quick spigots. Note: Meant the first 10 seconds of a supernova explosion, during that radiates almost whole energy. What happens then is from energetic point of view almost not interesting, although very long observable. 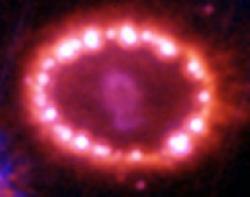 Another comment: analogy with the supernova is shown mainly as a curiosity, but for comparison: formation on the image to the right under copyright was formed after a supernova explosion (16 years later), when the shock wave reached the clouds of gas, that were released from the parent star 20,000 years ago. Illustrative image of this page in the very top right shows a regular figure in the grain, that was generated also in some way participating shock wave formed by lightning discharge. The exposure lasted for a split second. Last Introductory Note: the image under copyright very clearly demonstrates the kinetics of explosion (taking place mainly in the plane, ie 2D, like on the surface of a crop field...). over time will be considerably extended. Basic parameters of "normal, classic", average lightning (negative, cloud to ground). First Return Stroke based on measurements at the lightning channel base. Subsequent Return Stroke based on measurements at the lightning channel base. Continuing current (longer ~ 40 ms) About 30 to 50% of lightnings contain currents durations longer than ~ 40 ms.
M-component based on measurements at the lightning channel base. 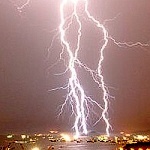 Number of strokes per flash 3-5 (About 15 to 20 percent of lightning flashes are composed of a single stroke). Matter is widely described in scientific literature. On the page Books is possible find many references to the literature on lightning discharges, of which stands out in particular already mentioned Lightning: Physics and Effects, V.A.Rakov, M.Uman (2007). Summary of contents, link to Google books. It is one of the largest works, ever written about the processes of lightning discharges (687 pages, over 6000 references). Also any other book of both authors contains among other things comprehensive reference material. For example The Lightning Discharge, M. Uman (2001) - over 1200 references (the reference to Google books). Regardless of what happens before and after, the most important (also the strongest) part of the discharge is the Return Stroke. Although it transfers most of the discharge energy (99%), but takes the shortest time (less than 10 millionths of a second, at least its most essential part of it). For this reason, also has a very significant mechanical effects. In certain cases may be a substantial part of the discharge energy transferred also during the process, which is called continuing current (occurs only sometimes). In certain rare cases it can take up to several seconds, usually a few tenths. Current, taking place between the cloud and the ground during that is approximately a thousand times weaker, than RS. Given the duration thus can therefore carry a significant part of the energy. Thanks to that there is conducted such a weak current - "only" hundreds of amperes, against hundreds of thousands in the case of the RS, and has a zero rate of the rise, possible its mechanical effects, compared with RS, to be considered as zero, also nothing induced to the surroundings. But it can cause noticeable damage, due to thermal effects for example on electrical installations or aircraft by direct hit. Likewise, it is almost certain, that may be involved in damage to plants, but not by the induction. Probably depends on the paths the current is conducted through and how it is spread in random paths. Thanks to the continuing current occurs occasionally very long delay between some of the subsequent RS of the same discharge, which tend to average distance 50- 60ms and rarely exceeds 250 ms. Due to the dynamic movement in the atmosphere (travel of ionized air channel downwind) can such afterdischarge impact on more than tens or hundreds of meters from the first RS, and through electronic measuring equipment used to evaluate the impact of the lightning discharge positions may not be evaluated as a part of the same discharge. On that page there is mainly picture documentation of localized crop circle locations, but also ( mainly) irregularly lodged (damaged, weakened) crop (RDF). They indicate quite clearly, that easily localizable lightning rods, that may attract lightning discharge similarly, as the smell of beer an alcoholic, are located on the fields in a very extensive counts. They are mostly columns of power lines. Also often high-voltage wires, that attracted the discharge, and then it fell down under them. In some cases, are columns almost a part of patterns, and in case of some photos is really difficult to imagine, that the pattern was originated differently than through a discharge atracted by there present earthing. is an inseparable part of each lightning conductor, also electricity poles. Used to conduction of the discharge current into the ground as quickly as possible, to minimize the damage. The better the earthing and lower conductor resistance, the less voltage created on it during passing the discharge current and radiated less thermal energy, which does not damage the immediate surroundings to such an extent, as would be in the case of higher resistance. The issue of grounding is technically quite detailed in Electrotechnical Standards EN62305. It is absolutely certain that every (working) power line pole is designed in accordance with them and in specified intervals inspected. Lightning rods are proposed and designed for maximum peak currents 200 000 amperes. Such lightning discharges have already found a really rare, but exist. Totally will take place annually in the atmosphere for approximately three billion of lightning discharges, current curve peak value of 30 000 ampere is the average value of most of them. But most does not mean all. In addition, in the fields of crop there are many "non-standardized" lightning conductors - one hand of artificial character, made by people, although in no case for grounding: water supply, distribution of irrigation. Different utility lines, that neither interfere up to the surface, they are stored completely underground. The character of soil disturbance by the earthwork, excavation, laying of utilities, protective layers and re-filling. Shielding, grounding and protective layers, or accompanying humidity in the case of underground drains may contribute to increase the conductivity of soil and ground surface directly above them by several orders of magnitude. Additional notable lightning conductors are piles of manure. They contain significant amounts of soluble electrolytes (urea, nitrates, nitrites, degradation products of plant material). There are many orders of magnitude more conductive, than normally in the soil present subsurface water. In addition, therein occur by chemical and related processes taking place significant heating and evaporation against surrounding, so that the air is saturated with ions and significantly more conductive up to many tens of meters. Electrostatic processes during Preliminary Breakdown may cause a very significant power conducting over them, thereby further increasing the amount of conductive ions due to electric field ionisation, and can result in preferential conduction of the Stepped Leder (SL) to such places, as well as much easier from such places raises Positive Streamer (PS), that after connection with SL (Attachment Process) ultimately creates a conductive path finally connected between cloud and ground and conduction of thr first Return Stroke to the ground, which can be followed after an interval by several more of subsequent strokes. Else is possible to mention the earthings and lightning rods of natural character - trees, shrubs, pools of water, springs, geological faults. By the way, all dowsers, who in every movie or document about crop circles are as busy as little bee and the dowsing rods in their hands are spinning like weathercocks. They were never able in their simple-minded brains, nor any of bystanders or crew, were unable to realize the most important thing: What are their senses responding to, are only springs and geological faults, or any other underground artifacts, which significantly contributed to attract lightning discharges. In the same extent may contribute on their perception and rods movement many consequential effects, caused by lightning hit in that place. Magnetism, remains of static electricity, dangerous chemicals created by electrolysis and pyrolysis. Last but not least, the movement of rods are caused also by subjective, unconscious visual perception - the presence of incomprehensible regular patterns. In any similar document was never demonstrated a blindfolded dowser. On the site where crop circles are present, would be probably a trained monkey succesfully dowsing, if not blindfolded. The last possible type of grounding (actually also lightning rod), that may be mentioned, are tramlines. They can be considered halfway between artificial and natural. They collect and keep water and humidity for much longer period, than their immediate surrounding, thus they are much better current conductor. Thousands of photos. As mentioned on many other pages of this website, also may be very significantly contributed to the conducting electricity throughout the field to locations, where lightning discharges did not impact at all. Tramlines is a page, where is paid a special attention to them. Better whiskey, malt, barley, brewery, beer, brewing. Better malt, brewery, barley, brewing, whiskey, beer. Many injuries and deaths can be prevented through an understanding of the dangers R.Nealof power lines, electrical appliances, extension cords, and lightning. An intelligent hell would be better V.Hugothan a stupid paradise. I never did a day's work in my life.T.A.Edison It was all fun.